Request appointments, refill medications, or ask general questions. It's free and easy to sign up. Use the Health Portal Login on the left to begin. Enter your email address and select "first-time login"
Once registered, return to the login screen to sign in to the system securely. Videos include high-definition footage and animations to explain common and more complex health issues. The program below is just one example of the health topics covered. Videos are 4 to 6 minutes long and available to you at no charge. A searchable library of health articles is also available for you to search, download, and print at your leisure. 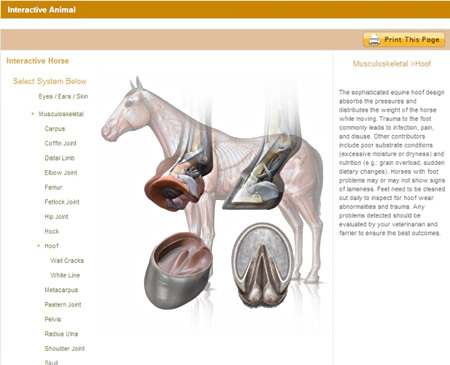 EquiHealth provides an "interactive horse" to help you explore equine anatomy. Equine body systems, illustrations, and in-depth diagrams help you learn more about your horse's health. Access these educational resources and more by enrolling in EquiHealth. Click " Health Portal Login" on the left to begin.